Super Junior reminisced about the past on the March 23rd episode of 'Super TV'. 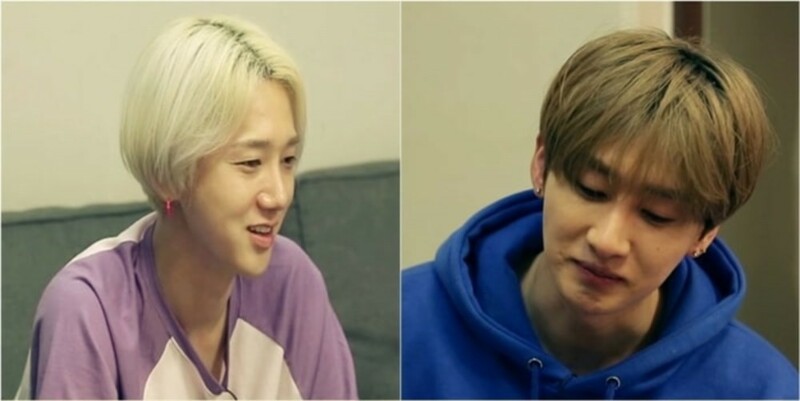 For part 2 of the 'We Moved in Together' special, Super Junior were paired off into roommates with members they were not as close to with Shindong pairing with Donghae, Leeteuk going with Heechul, and Yesung with Eunhyuk. At Eunhyuk and Yesung's place, they discussed their harsh trainee days. Eunhyuk opened up, revealing how he lived in a half-basement apartment at the top of a hill in his last year of high school. One day after school, he found his mother laying on the floor after a hard day of work. He expressed, "I still remember how my mother looked that day." Heechul and Leeteuk also discussed their friendship that started out strong, but waned over the years due to worries about their career. Heechul stated, "If you think about it, we were less awkward when we were trainees. When we went on variety shows, all the members would prepare things together, but I prepared alone," and Leeteuk commented, "You were more famous at the time because you were on TV. A manager told me once, 'Heechul is going on a show, so I got you in too. If you don't do well, you know what's going to happen, right?" The two expressed that though there were difficulties because of fame in the past, they were more understanding now as grown adults. Heechul explained, "As we started to work, we did well in what we did. We started getting into conflicts," and Leeteuk agreed, "We won't be able to ignore the time we spent together. Since we're halfway through our 30s, I think Heechul and I are beginning to understand each other." In other news, Super Junior recently dropped their pre-release track "Super Duper", and they'll be releasing their repackaged album 'Replay' on April 12. Have you been watching 'Super TV'?